Nothing’s official yet, but all signs are pointing in the direction of the disabled list for Andy Pettitte, who left Wednesday’s start after just 77 pitches. Andrew Marchand of ESPN New York is reporting Sergio Mitre or Alfredo Aceves would replace Pettitte in the rotation — not Joba Chamberlain or Ivan Nova, the best young starter for Triple-A Scranton. 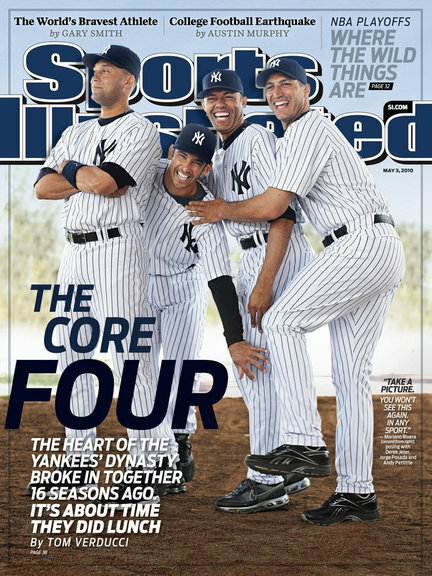 Either way, Pettitte’s not healthy, and I’m blaming this Sports Illustrated cover of the Core Four. I don’t normally believe in jinxes, but this is getting ridiculous. Since the issue was released, Jorge Posada, Mariano Rivera and now Pettitte have sustained injuries. All I have to say is: Derek, watch out!